Animal abuse is very much real and its stories are often told in documentaries, long journalism pieces or specialized books. One author, however, decided to put a fictional spin on it. 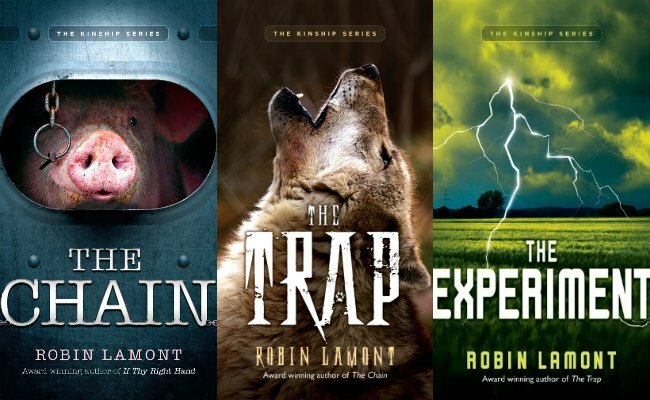 The Kinship Series by Robin Lamont is a collection of three suspense novels focused on animal protection issues — and with hidden secrets, nefarious organizations, deceitful dealings and astonishing cruelty to be exposed, there’s more than enough drama to be borrowed from reality and put onto the pages of the thrillers. The books follow Jude Brannock, a tenacious undercover investigator working for The Kinship, a nonprofit group fighting against animal cruelty. In the first of the books, “The Chain,” Brannock is summoned by a whistleblower to a small town where a pork slaughterhouse plant is located. When she arrives, however, she finds her informant has mysteriously committed suicide. Determined to find out exactly what happened, in the process she gets closer to a family that depends on the meat packing plant for survival, showing a different side of the system of animal cruelty animal advocates don’t usually consider. What will sound familiar to them, however, are the images of cruelty happening behind closed doors at the plant, something Lamont wanted to show readers in context. Lamont is no stranger to the world of animal protection or undercover investigation. She’s a vegan who has a rescued Golden Retriever she calls the love of her life, and before she started writing, she worked undercover in New York City. While admittedly, she says her work wasn’t as dangerous as the one of her lead character in her novels, she believes her experience gave her a valuable insight into the undercover world. The years she worked as a prosecutor in Westchester, N.Y., after that were also useful once she decided to write suspense novels since she’d written more legal briefs than she could remember. It was her love of animals, however, that sparked the career change. Lamont’s words could easily be uttered by her main character who is always relentless when getting another door slammed in her face while fighting for animals. In the second book, “The Trap,” she gets to see how it’s not only private corporations that are involved in systematic abuse and has to tackle wildlife services and its so-called conservation efforts. Lamont is currently working on the third installment of the series, which will be available in 2017 and will focus on animal experimentation. Just as the other two books, however, there will be a strong emphasis on how humans are impacted by animal abuse — including some challenges for Brannock. Despite the heavy topics, the books are surprisingly easy and quick reads — which is exactly the point, says Lamont. You can buy The Kinship Series on Amazon. Tell U.S. lawmakers it's time to create a national animal abuse registry! Looks intresting, but I don't have a Kindle, so I'll have to pass. I'm not allowed any more real books, I own too many.